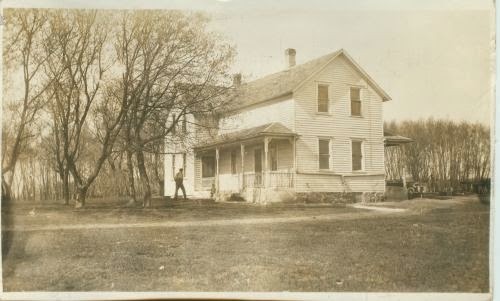 It's always a thrill to discover a new photograph, such as the one of this lovely large home, printed as a postcard. 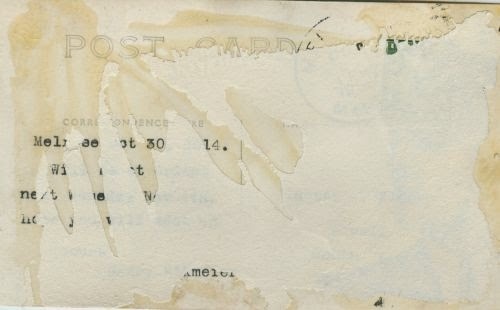 But how frustrating to turn it over and find writing - but due to paper glued on the back, it's impossible to read it. Being able to put a date to this card also helped to date photographs from visits of the Eikmeier family to the Kluthe family; prior to being able to read this postcard, I was only able to guesstimate the dates within a few years. In addition, I can add another date/place to the Eikmeier timeline. I have a number of old photos and postcards that have been glued into albums, and the unfortunate part is that most of those albums had black paper rather than white, so this tip won't work for every situation. But in this case, it saved the day. This is the second-oldest item I've discovered in the bowels of my office - the oldest being a commencement program from 1884 - but this item is interesting as well. It's a 1919 calendar from Turlock Mercantile Co. in Turlock, California. Besides its age, I thought the overall design of the calendar was interesting. 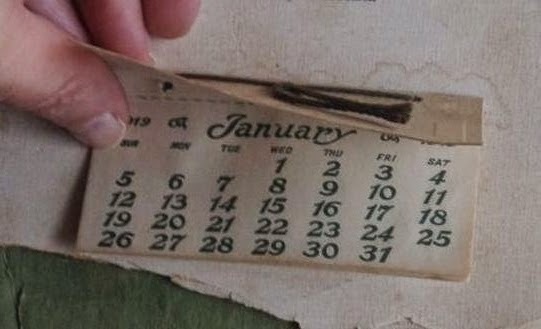 Although a little ripped up and some water damage, the calendar portion looks like it was never used. 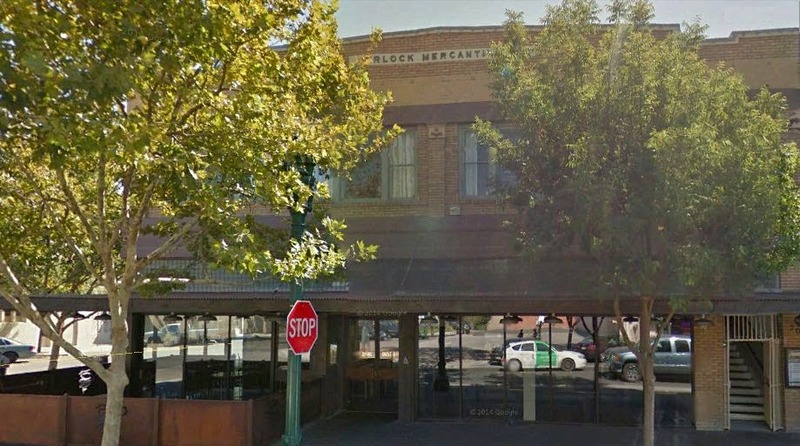 The Turlock Mercantile Building as it looked in 2014, photo courtesy of Google Earth. Many businesses have inhabited the building over the years, from the dry good business that started it all, to retails stores, offices, even a boarding house above. It started out as a wood building, and was bricked later. An article in the Turlock Journal notes that paranormal investigations were done at Turlock Mercantile building in 2008. Numerous reports were made over the years of strange noises and ghost sightings, so some amateur investigators decided to look into it, and got strange results themselves - the article says it better than I could: "[They] got more than they bargained for when rattling noises began and the front door alarm went off right in front them. Even more spooky were the sounds of footsteps and a six-digit phone number being dialed the recorder picked up and the unexplained ending of the tape, even though the reels were still turning." At that point, they brought in the professionals who did their own investigation and concluded that the ghost of the building's founder, Horace Crane, was among many that still called the building "home." If you want an interesting read, consult the original story at http://www.turlockjournal.com/archives/6309/. 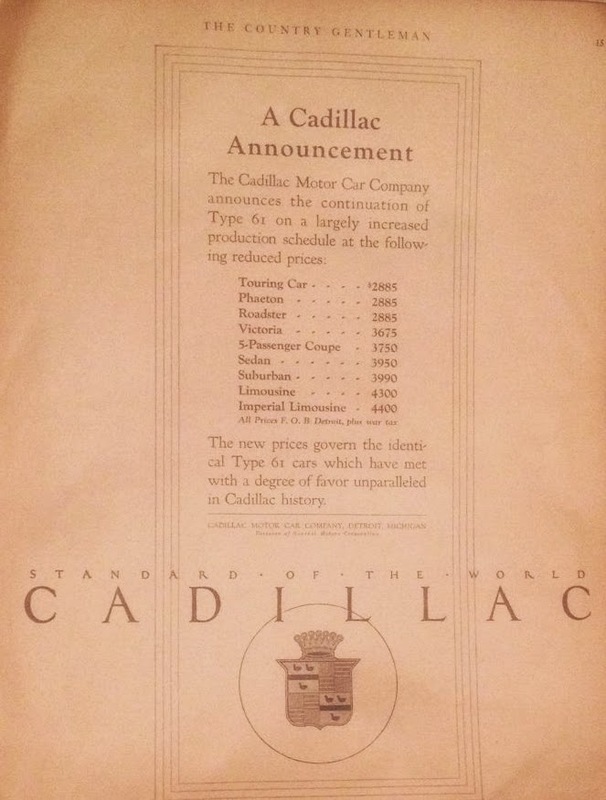 Today's find is a Cadillac advertisement from the January 6, 1923 issue of "The Country Gentleman." Research or lookup volunteers are anxious to help others with their genealogy research, mostly because we've all been helped so much ourselves. But burnout is a problem that can easily be avoided with a little consideration for those trying to help you. 1) If you find yourself beginning your email with "Looking for any information..." stop right there. Consider this from the perspective of the volunteer. I have delved into whatever resources I had, and come up with a nice amount of information to send back to the requester, only to be informed that they already had that information. When you ask for help, rarely are you looking for "any" information. You've already got *some*... do your volunteer a favor and tell them what you have, and specifically what you'd like to find. Please be respectful of our time and effort. 2) Clearly state what geographic area and what time frame is involved, don't just give us a name. 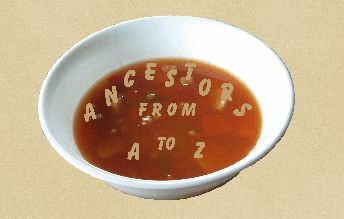 Many of us have our contact information on many state and county sites as volunteers; we don't automatically know where your ancestors are from or when they lived. 3) Read carefully what your volunteer is volunteering to do - if I have a particular book I'm willing to do lookups from, please don't ask me to go to the courthouse and get a birth certificate. 4) Please don't request information that you could easily find yourself using Google. 6) If you have a white list set up for your email, add the volunteer's email address to it. Don't ask us to fill out a questionnaire to be able to send you your results. 4) Most of all, please say Thank You! Chances are, your volunteer took time away from their own research to help you out, so acknowledge our efforts, even if we didn't find what you were looking for. A little appreciation is all the pay we get - please do give us that. More postcards from the collection of Elvirta Graves Knutz. "Virta, do you suppose you will ever look like this?" Postmarked 1915. Sent to Virta, then a young wife, from her mother. Should we read between the lines? Yes, I'm still cleaning out my office. I began chipping away at a tall pile that was threatening to avalanche, and discovered a box of old paper items I bought at a garage sale 2 years ago. The following is a loose page ripped out of an old, unknown risqué publication. I wish it had a date on it! I'm going to guess 1920s. 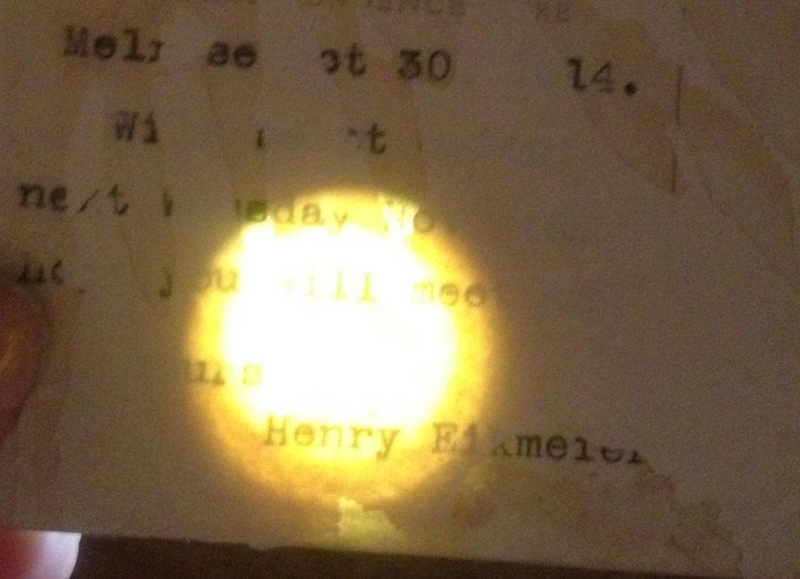 My great-grandmother, Elvirta Knutz, loved postcards, as did her extended family. As a result, we have a nice collection. I'll share a few here. I love how pleased the little girls look to see their brother getting a spanking! "If you have no money why you needn't come around"
Cleaning Day. Postmarked 1911 with a one-cent stamp.